I sent a lovely half term afternoon in Fishguard with my daughter yesterday. The weather was gloomy, but the drive across the Preselis was dramatic and uplifting. After a swim at the leisure centre, we had a mooch round the charity shops and I found these lovelies in the Paul Sartori charity shop. I did chuckle to myself as the woman in charge of the books took the time out to point out her own special filing system of the books. She threw a disdainful arm towards the ‘chick lit’ while running her hand tenderly along the ‘better books’ and classics shelf. Meanwhile the thrillers only got a cursory nod over her shoulder. I assured her I’d be sticking strictly to the better books, so she gave me an approving smile and left me to browse. I can’t say enough good things about Cat’s Eye. I first read it over twenty years ago, and when I re-read it last year, I was amazed that I remembered even tiny details very clearly. It made a big impression. I listened to it on audiobook years and years ago and while I can’t remember much about the plot, the mood of the novel stayed with me for a long time. I’m really looking forward to revisiting it. Ah, Gavin and Stacey. Such writing genius. Come to think of it I really ought to knit a little James Cordon, especially as he’s a fellow hammer! Lovely! I have the exact same edition of Cat’s Eye – my favourite Atwood novel. (and here’s the *rest* of the comment….) – I keep meaning to re-read Cat’s Eye as I haven’t picked up an Atwood for a while and I remember this fondly. Lovely finds, and sounds like my kind of charity shop! I read Americanah by Chimamanda and I also picked up Purple Hibiscus recently. I’ve read books by the writers featured in the pictures, and I can vouch for the authors and say that their books are better than others. By the way, I saw Travels with my Aunt, by Graham Greene, adapted for the stage. I believe you posted about his work. I loved ‘Americanah’. Chimamanda scares me with how accomplished a writer she already is at a ridiculously young age. 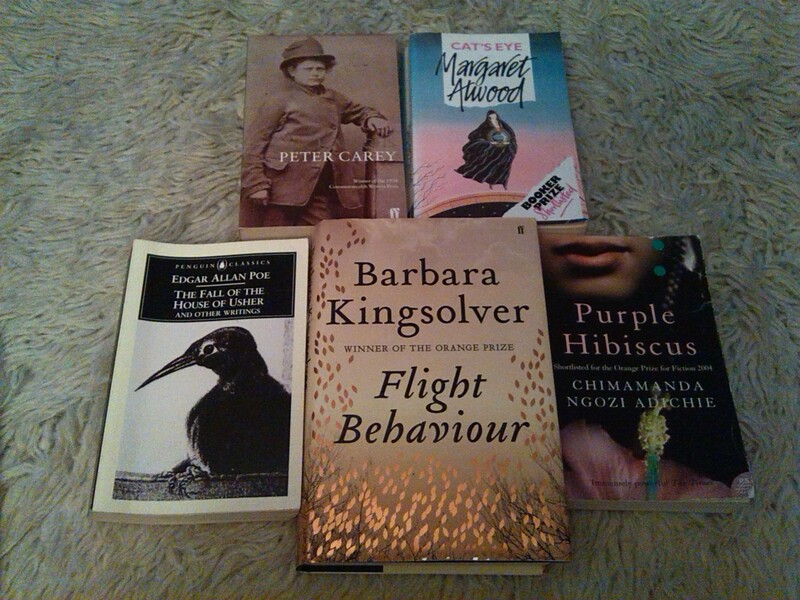 It certainly was a great haul and at between 60p and 80p a book, a total bargain too! Ooo, how was ‘Travels with my aunt’? I do love live theatre. I’ve not read that yet, it’s Lucy, my partner in hardbookhabit crime that’s the Graham Greene expert. I don’t know how she gets so much more read than I do, I swear she’s got a tardis! Sorry for the late response. I’ve been very busy. Travels with my aunt was great! The play had great comic relief, and the actors each played many parts ( men played the female roles as well). It showed that we all live our lives very differently and that what others see as dull, may be quite exciting for some. Sometimes, however, we may be in need of a new dose of life that allows us to have a different experience so that we won’t be quick to judge the life others lead. It was worth seeing. Nice place. Theatre, arts centre, and two bookshops next to each other. Quite a haul for such a diminutive charity shop in a bijou town. I do love Fishguard. It also boasts a magnificent wool shop. I have to ration visits or I’d be bankrupt!